Small businesses rely on word-of-mouth marketing; I’ve never found one that didn’t. Some rely on it more than others, but I think every small business needs happy customers and/or interested observers to help spread the business name to friends. This human element of marketing is part of the SEO Success Pyramid, and can come in several forms: buzz/viral marketing, word-of-mouth, community development, and more. These aren’t found among the pyramid blocks, but they help you along as you work your way up the pyramid. They’re the gray arrows on each side pointing from bottom to top. Community was the focus of Wendy Piersall‘s excellent presentation last month at the Small Business Marketing Unleashed conference in Houston. Wendy runs Sparkplugging.com, a super-successful blog network with a large community of readers; your situation may be different, but you still have a community of customers and need to take care of them. So, in the points below, I’ll add “customers” next to each mention of community to show how the ideas apply to any business. One of the key points Wendy emphasized is the need to take good care of your community. With every decision you make, ask yourself what’s in it for your community (customers). Because that’s what they’re always asking: “What’s in it for me?” If your community (customers) wants something, give it to them. Making happy customers is your primary goal; happy customers are the ones most likely to tell friends about your product or service. Strong word-of-mouth marketing always begins with happy customers. People want to connect with people. Be authentic, be personal to maintain relevance. Make your members (customers) Rock Stars. How? Reward their participation: give public recognition, create membership levels in a forum, showcase their talent, etc. You may not be building a blog network, or creating the next great niche forum, but the concepts of community development apply to any business. 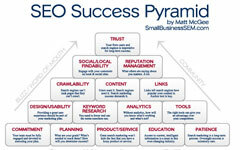 And they’re an important part of the SEO Success Pyramid. A strong community of happy customers will push you up the pyramid more quickly, helping all aspects of your online marketing plan. You can download Wendy’s “Building a Community” presentation on Sparkplugging.com. Matt, I have been in Web design/development fulltime since 1997. I’ve been existing in a sort of industry exile here in Las Cruces, New Mexico. Only over the last several months have I allowed myself the time to read the better blogs on SEO. I must say that the clarity & quality of your posts have informed and inspired me like no others. Thank you for being there! I visited Las Cruces about 20 years ago, when I was doing play-by-play for the Pepperdine U. campus radio station. Our basketball team was playing an NIT game against NMSU. Didn’t get to see much of your town, though — was a real quick trip. 1) Make it easy for customers/community members to voice their opinions about what your site should include/focus on. 2) Implement the good suggestions. 3) Announce you are making changes/producing new content and why/where the ideas came from somewhere on your blog. 4) Get links from your tech-savvy users who had input into your changes/content. Regardless it is a win-win when you listen to your community and vice versa. I’m not feeling like as much of a rock star anymore. However, I loved this article! Wee FM…all wee, all the time. I like that. thanks for sharing Matt and Wendy! @Miriam – I did turn off that plugin, you’re right. Sorry about that, but I didn’t have much choice. There was no way to set it so that stars would be turned off for my own comments. And with all the comments I leave, the row of stars next to my comments was obnoxiously long and distracting. I’d bring the stars back in a heartbeat if I could remove them from my own comments…. I like the WIIFM. It is a nice twist to a, I must say, not a very new view on the importance of community building. Love this blog, what a wealth of information. I am taking away some great insight from the Communicating with your Community section.